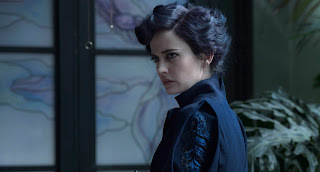 Release Date: September 30, 2016 – U.S.
"Miss Peregrine's Home for Peculiar Children" is a whimsical fantasy from director Tim Burton, but like all of Burton's work, there's a darker edge too. Jake (Asa Butterfield, "Hugo") is a lonely lost boy living in Florida. While the skies may be sunny, his life is anything but. His father (Chris O'Dowd, far removed from his usual friendly, folksy demeanor) is cold, distant, and doesn't understand him. His grandfather, Abe (the superb Terence Stamp, making the most of his limited screen-time), is said to be suffering from dementia. When Jake was younger, Abe would tell him fantastical tales about growing up in a group home surrounded by other children with special abilities and their mysterious headmistress named Miss Peregrine. It was the perfect bedtime story for a child to fall asleep to. But Jake is now a sullen teen. He no longer considers himself a child and has put away childish things. If Jake wasn't a child before, he's forced to grow up quickly when he discovers his grandfather dead in the woods with his eyes sucked out. Nightmares and trauma follow, but his psychiatrist (Allison Janney) assures him he's not crazy. Jake wants to visit the children's home of his grandfather's youth. It's a long way from Florida to Wales, but his father reluctantly agrees because the trip could provide a much-needed sense of closure. These are rather weighty themes to explore so early in the film, but it isn't long before Jake ends up in the 1940s of his grandfather's childhood and discovers that all of those amazing bedtime stories were true. There really was a Miss Peregrine (a delightfully off-kilter Eva Green) and she really did run a school for peculiar children. Abe's past has become Jake's present. The boy hasn't landed in a fairy tale, though. Trouble is brewing. Emma (Ella Purnell): Floats through the air. Finlay (Enoch O'Conner): Brings inanimate objects to life. Bronwyn (Pixie Davies): A little girl with superhuman strength. Hugh (Milo Parker): Bees live inside him. Claire (Raffiella Chapman): An extra mouth resides in the back of her head. Masked Twins (Thomas and Joseph Odwell): Short and creepy – somewhat reminiscent of Sam from "Trick 'r Treat." Fans of the Ransom Riggs novel, which I have not read, will immediately notice one major discrepancy: The characteristics of Emma and Olive have been swapped – for reasons unknown. Silver Screen Sister lamented that there were many changes made from the book. The Peculiars are eventually greeted by two guests: one welcome and one unwelcome – the wise Miss Avocet (Judi Dench) and the villainous Barron (Samuel L. Jackson). Meanwhile, back in the "real world," Jake's bird-watcher dad has bonded with a fellow ornithologist (Rupert Everett). 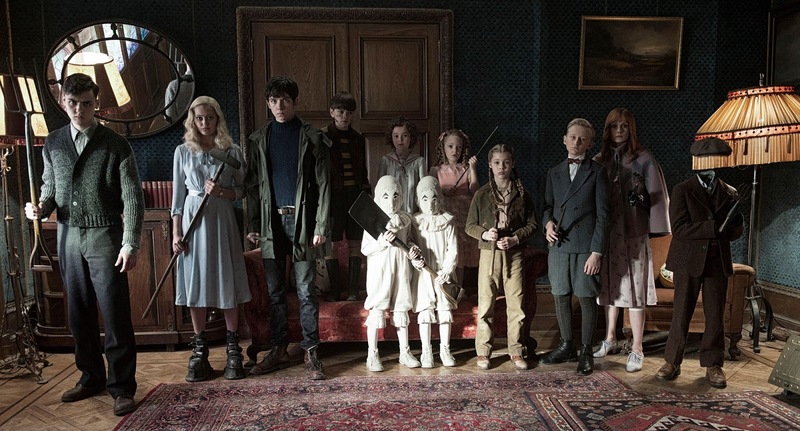 "Miss Peregrine's Home for Peculiar Children" is overflowing with creativity. Therefore, it is with a little guilt that I admit I was never quite able to love it. Don't get me wrong, it's still great fun. The Peculiars are interesting, the set-pieces are fantastic, the action is thrilling, and the emotional moments are well-played. Yet, all of those elements don't feel entirely cohesive at times. The same movie that deals with a boy's loneliness and grief also features Samuel L. Jackson mugging for the camera with wild white hair and garish fanged teeth. Because of that, the quieter human moments didn't affect me quite as much as they could have and the big battle scenes felt slightly lower-stakes than they should have. Still, the ending sequence is amazing. Unfortunately, it's comprised of only rapid-fire clips and a quick explanation from one of the characters. I could have easily sat through another hour of the developments presented in those final few moments. What a missed opportunity! It almost felt like a TV show that was cancelled unexpectedly and had an epilogue added in post-production to wrap up any loose ends. 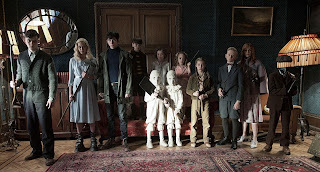 "Miss Peregrine's Home for Peculiar Children" may not have captured my heart the way I was hoping for, but there's still plenty to like and recommend about it. If nothing else, it's another opportunity to take in Tim Burton's unique blend of oddity and spectacle. This is the best movie critic blog out there! Thank you CS for your honest, analytical critiques of modern day filmography.